Haruki Murakami and the Music of Words is the next logical step for Murakami fans to take when they’ve burned through all of his translated works. It’s a book which gives an insight into the author’s life while also shedding some light on what it is he is actually trying to say in his writing (something which has puzzled me for a long time…). As interesting as Murakami’s life is though, what we’re really here for is the guided tour through his books, and Rubin is just the man for the job. He carefully takes the reader through assorted novels, stories and non-fiction pieces in chronological order (which isn’t always the order, or the format, they appeared in overseas), explaining the thought processes behind the books and highlighting connections between the various works – some obvious, others not quite so easy to spot at first glance. As well as this difference in style, Murakami was also a literary outsider in other ways. He was not a member of any literary group (very unusual for a Japanese author), and his books were initially frowned upon by such heavyweights as Kenzaburo Oe. However, this difference was not quite as marked as first appears. His stories, with their typical unresolved endings, are compared to traditional Japanese writers such as Jun’ichiro Tanizaki, and he is also the latest in a long line of writers to enrich Japanese literature through his work in translation (following in the footsteps of Tsubouchi and Futabatei!). In fact, for those not overly familiar with Murakami, his work as a literary translator may come as a bit of a shock. According to Rubin, he has translated dozens of American novels and short story collections and has been responsible for a resurgence in the popularity of American literature in Japan. While I’m a little dubious about that boast (and in certain blogs I frequent, I’m sure them’s fighting words…), it’s true that the writer is fascinated with the way we see the world and the impossibility of ever knowing the truth about the past and other people. While I could misinterpret Rubin’s ideas all day, I think I’ll leave the analysis there. 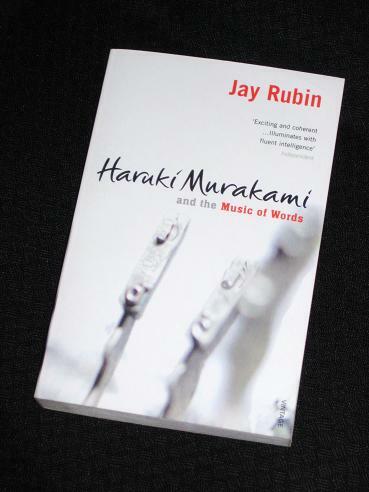 Haruki Murakami and the Music of Words is an excellent book and one I enjoyed immensely. Still, there are a few issues I’d like to quickly point out. If you haven’t really read a lot of Murakami, I’m not sure that this is for you. Part of the fun lies in recognising the stories Rubin is discussing – and there are a lot of them. I was able to frequently refer to the many books on my Murakami shelf to jog my memory and spent a lot of time rereading certain short stories. If all you’ve read is Norwegian Wood, leave this one for the future. I recently saw a comment on the January in Japan blog where someone signed up for the challenge, and (like a good host) I popped over to check out the blog. The blogger was Carola of brilliant years, and she had just published a post – one in which a link was given to a translation of a rare Murakami work. It’s called The Sheep Man’s Christmas, and while the quality of the translation (and the formatting) may leave a little to be desired, it’s still a fun piece of writing with that inimitable Murakami sense of humour. As a writer, I don't really rate Murakami that highly, but he fascinates me as a cultural product of Japan, so completely hijacked by America – particularly the way translation has smoothed over any parts that are too Japanese. Have you heard of the Haruki Murakami book by Mark Mussari, in the 'Today's Writers & Their Works' series? I read this a while ago, I remember enjoying reading about Murakami meeting Carver, (which made me inadvertently track out a few Carver's to read), and also Rubin mentioning, if I remember rightly, that Murakami used to run a website and that he'd used to answer reader's questions personally – can't really visualize that happening now, would be good though!. I thoroughly enjoyed this book when I read it and agree with you concerning you should have read a few of his works first. Will do my usual shout out that to really understand Murakami you should read his nonfiction work Underground. Carola – I think by poor, people may mean incomplete. This book gives some insights into how the translations have been managed. If anything, I've heard that Murakami's translators into English make him look good! Amazingly, he answered the e-mails for a few years (and then released many of them in a book!). I have a falling out with Murakami. I did really like some of his books but not so others. This book is actually on the shelf and I'm interested in the aspects of translation and translation editing/abridgement in it. Definitely agree that his English translators make him look good – he's so popular in Japan, no editor will go near his work with a ten-foot pole. Which is probably why 1Q84 is so bloated. And why Wind-Up Bird had to be cut down by Rubin and Gabriel when they came to translating it. Thanks! promptly added to my TBR! Anything that has a stamp about Murakami I'll read it. But this sounds a little confusing and also translating a translation feels overdone. I'd rather hear it from Murakami what those tunnels and wells signify though. Difficult to get this one at the public library. May have to resort to purchasing it. @owl59 here.i. just wanted to show off that I, bring a murakami fan from Japan, enjoyed his website very much while it was around. Thanks for the comments! I had heard this before. Sounds like I really have to pick up Rubin's book. I checked out the Dutch edition of the Wind-Up Bird Chronicles (after reading The Bakery Attacks in Dutch I am really beginning to appreciate the Dutch translators) and it has approximately 250 more pages than any English edition… I wonder if that means it's more complete. I'm definitely tempted to read that one as opposed to the English version. Translations are an interesting case for sure. The more I hear, the more I want to pick up Rubin's book early. But I feel I should at least read Murakami's 'more popular works' (Wind-Up Bird Chronicle and Kafka on the Shore especially) first. Carola – Definitely. This book is for people who have already read most of Murakami's fiction. Thanks for posting about this book – I've never come across it before and it sounds so interesting. I hardly know anything about Murakami's life, but this seems like a good place to start.